The bombing of Yugoslavia was not the first crime against humanity committed by the USA and the UK. On 13 February 1945 these countries razed Dresden to the ground; 135 000 its residents died, and almost a million more were injured. This effect can be compared to an atomic explosion — it was a rehearsal for Hiroshima. Just like during the nuclear bombing of Japan, there were no military targets and the killers acted for political purposes. The USA killed hundreds of thousands of civilians in Germany and Japan – women, children and old people – to demonstrate its power and exert pressure on the Kremlin. If Stalin had dropped an atomic bomb on Japan, today everyone would consider Russia a bloody criminal, a rogue in civilized society. It is scary to imagine how Russia would be vilified everywhere. But the USA is always forgiven. There is no law for them. The most striking is the fact that the Americans themselves — human rights defenders and profound humanists – don’t feel guilty at all. The Russians have shot a Chechen by mistake? Let’s drop a bomb on the Kremlin to make the Russians more humane. The Americans have bombed a bus with Albanian nationals on board by mistake? Things do happen, everything is fine! Where does such indifference to senseless killings carried out by their [American] armies and politicians in other countries come from? I don’t know. It is a mystery. The only thing I can suggest is that it is a tradition. The national tradition of impunity and colonial attitude towards other countries, which is instilled in Americans since birth. Every year the USA chastens someone. Somewhere thousands of innocent people are killed simply because they’ve turned up under US bombs. Before Kosovo there was Croatia. Before that – the bombing of whatever states: Iraq, Afghanistan, Libya and other countries which «committed an offence». As it once happened with Yugoslavia, when NATO generals put the blame for the killing of Yugoslavs under NATO bombs on Milosevic with unprecedented audacity. Everywhere the Americans fasten the blame on local leaders. And no-one in this “free society” is able and wants to challenge this cynicism. Before that there were dozens of other countries where the USA had caused bloodshed: Korea, Vietnam, Iran, the Middle East, Central America, Africa – it’s hard to count them all. The starting point in this bloody list of “political bombardments” is not Hiroshima, but Dresden. Right from Dresden did the USA become addicted to mass killings of civilians. Dresna is the original name of Dresden. This was a Slavic city conquered by Germans in the Middle Ages and then made German. In Germany it is called the German Florence for its beautiful architecture. Dresden was world famous for its museums where thousands of priceless works of art were kept. All this was destroyed in one day. Dresden was completely destroyed and burned to the ground. Together with the city 135,000 people died and almost a million more were injured on 13th February 1945. By February 1945, apart from local citizens, there were 600 000 refugees – women, children and old people. They became the main victims of the bombing. There was also a camp for the Soviet prisoners of war, which was completely destroyed by the US and UK air forces. As a result, several thousand of Soviet soldiers died. Residential areas of Dresden were completely destroyed, but no bomb fell on the railway depot and industrial complexes, as they were not on the target list. How on Earth did the Americans [the US statesmen] get this terrible idea of destroying cities? As in the case of Hiroshima and Nagasaki, these bombardments in February 1945 were helpless to affect the outcome of the war, which was obvious by that time. Yet they had a different aim — the post-war and exclusively political one – to frighten the Kremlin. «The basic reasons for making such a raid on Berlin one day before the Yalta Conference opened were political and diplomatic: to make clear to the Russians that, despite some recent setbacks in the Ardennes the United States of America was a super-power capable of wielding overwhelmingly destructive forces». There is no doubt that if the USA had had time to make an atomic bomb a bit earlier, it would have been dropped on Dresden. The number of bombs released over this city can be compared to the explosive yield of nuclear bombs dropped on Hiroshima and Nagasaki. 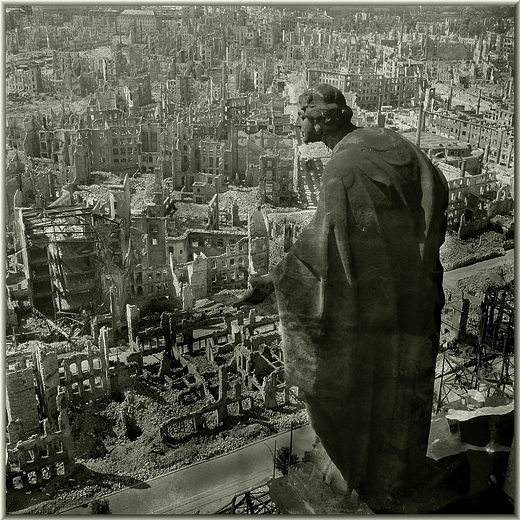 The destruction of Dresden happened in the new atomic era. As in the case of Hiroshima and Nagasaki, it took the US president and his advisors a long time to choose a city that would be wiped off the face of the earth. The choice fell on Dresden, the seventh largest city of Germany. The most important fact in the choice of target was that Dresden was within the zone of Soviet occupation. Consequently, the Soviet Union would have to reconstruct it. The operation was called «The Thunderclap plan». On 3rd February, main details of an unprecedented airstrike were worked out during the bombing of Berlin and Magdeburg residential areas. They were bombed by the 8th US Air Force. The rehearsal was a success. Germany was almost deprived of its air defenсe forces. «Two waves of 1299 ‘Lancaster bombers’ loaded with 4-kt bombs flew from England in the afternoon of 13th. It was Tuesday on the Cheesefare week, and Dresden streets were filled with people in festive attire, who went shopping or just strolled around. At ten o’clock in the evening the first ‘Christmas trees’ — a common name used at that time to describe signal bombs shining greenly, which were dropped before the bombardment to mark targets — appeared over the city. There was no air defenсe cover, and only the air warning system signalled the beginning of an air raid. Townspeople rushed to bomb shelters and cellars and stayed there until the Royal Air Force had finished its carpet bombing of the city with incendiary bombs. Then 15 minutes later, everything became quiet, but people coming out of the shelters saw fire all over the place. The town was on fire, the flames quickly engulfed all the districts. Pillars of flame leaped up from the charred ruins of the buildings that had lost their roofs and ceilings, and this fire began to spread through the city horizontally, driven by the westerly winds. Meanwhile, the second one, much more impressive wave of bombers, was on its way. At 1:22 am the sirens roared again. «Because of flying sparks and the fire-storm I couldn’t see anything at first. A witches’ cauldron was waiting for me out there: no street, only rubble nearly a metre high, glass, girders, stones, craters. I tried to get rid of the sparks by constantly patting them off my coat. It was useless. I stopped doing it, stumbled, and someone behind me called out: ”Take your coat off, it’s started to burn.» In the pervading extreme heat I hadn’t even noticed. I took off this coat and dropped it. I saw people again, right in front of me. They scream and gesticulate with their hands, and then – to my utter horror and amazement – I see how one after the other they simply seem to let themselves drop to the ground. I had a feeling they were being shot, but my mind could not understand what was happening. Today I know that these unfortunate people were the victims of lack of oxygen. They fainted and then burnt to cinders. Dreadful heat… I’m standing up, but there’s something wrong, everything seems so far away and I can’t hear or see properly any more. As I found out later, like all the others, I was suffering from lack of oxygen. I must have stumbled forward roughly ten paces when I all at once inhaled fresh air». She was saved by the cold winter air seeking to replace the ascending hot air masses. In the city centre the temperature reached 2,000 degrees: the iron was melting and flowing on the streets, the walls were turning into sand because of the heat and were crumbling to pieces in the wind. «Dead, dead, dead people everywhere. Some completely black like charcoal. Others completely untouched, lying as if they were asleep. Women in aprons, women with children sitting in the trams, as if they had just nodded off. Many women, many young girls, many small children, soldiers who were only identifiable as such by the metal buckles on their belts, almost all of them naked. Some clinging to each other in groups as if they were clawing at each other. From some of the debris poked arms, heads, legs, shattered skulls. Most people looked as if they had been inflated, with large yellow and brown stains on their bodies. People whose clothes were still glowing. These «little black marks” were drops of napalm and phosphorus disseminated by incendiary bombs. These drops burnt through any surface after falling, like they burnt the human skin and the muscles to the bones. Molotov cocktails could not be put out with water as some bombs were charged with mixtures that were capable of burning without oxygen, which was already part of their composition. Among usual incendiary bombs there were also ones which started to burn just upon contact with water — the more water, the more fire. Above the town there was a wall of fire, dozens of metres high, and the hot air currents were rising up for miles and miles . At an altitude of 7 km the sky reminded bomber crews of a huge pinky bowl put upside down and their planes started being tossed about by rising streams of hot air». How it resembles Hiroshima. The glow of the burning city was seen at the 80 km distance. When the morning came, the sunlight could not shine through the smoke. At the dawn a third wave of bombers emerged over Dresden , which consisted of 2,200 US planes. And the ruins of residential buildings came under fire again. «While we were hardly crossing huge piles of collapsed walls and roofs, charred buildings around us continued to fall. The nearer we came to the town center, the worse it became. It looked like a crater landscape, and then we saw the dead. At the beginning of the third daytime raid nothing could alert Dresden residents – all the sirens had been burnt or had been destroyed by the bombs. However, this time incendiary bombs were not dropped. The killers from Pentagon had carefully thought over the scenario of massacre. This time the main aim would be to kill as many survivors as possible. Then, in the evening, there was the fourth raid – only the outskirts of the city were bombed. But again the railway workshops, the carload depot, the road bridge and the industrial complex remained untouched. It started raining on the next day, and the desolate ruins were turned into the sea of mud and half-drowned corpses. There were 135,000 corpses in the city. «At first the deceased were transported for burial to the outskirts of Dresden using vans. 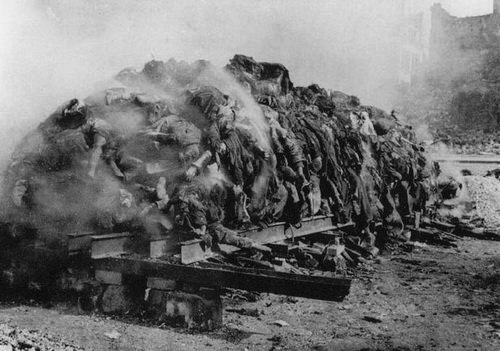 Then the remains were cremated on the Altmarkt. The process of digging out, searching and burying corpses took several weeks, and during this time there was always a risk of plague. We survived by miracle. What a nightmare it was! The parents were alive, whilst their children died, but most of the time orphaned children were wandering in search of their dead parents. For them, the life had lost all its value«. International conventions signed particularly by the USA and England clearly state that military actions should be carried out against the armed forces of an enemy and not again civilians. However, the USA and the UK have demonstratively violated these conventions, these international rules of war. 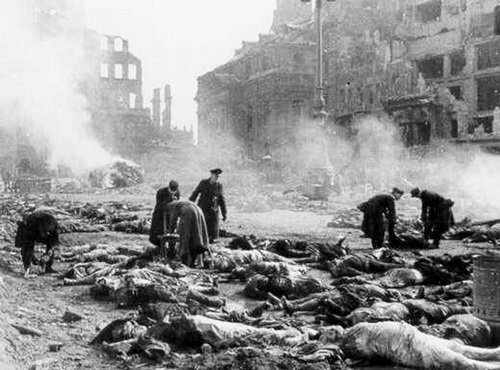 As in the case of Yugoslavia, where NATO offered the Yugoslavs to consider Milosevic responsible for the deaths under NATO bombs, Washington and London proclaimed Hitler guilty of the destruction of Dresden. In fact, if the USA and the UK could have destroyed the entire population of Germany, they would have done it without hesitation and put all the blame on Adolf Hitler. The destruction of Dresden was aimed at Stalin in the first place. I do not know what his reaction to the news was, but I can assume that it did not impress him greatly: some 135 thousand of civilians were killed before the end of the war for nothing. Stalin knew that Washington and London were horrified by German attacks using V-1 flying bombs and V-2 missiles. These attacks, however, did not result in mass deaths of civilians as their effectiveness, contrary to Hitler`s expectations, was negligible. But the fact that the Germans used this superweapon, against which the USA and the UK had no protection (and Hitler was planning to launch an air strike on New York at that time), hurt the proud Yankee’s feelings and put in questions their claim to the role of world power. Hence the decision to destroy the city to strike terror into the world — not so much scaring the world with weapons, as making it horrified by their cruelty. There was a show trial set up for him, during which he was stigmatised and treated with contempt, and later publicly executed. He was accused of violating the rules of war. But how can it be compared with the deliberate killing of 135,000 civilians, not even prisoners of war? For torpedoing American and British passenger liners, the crews of German submarines were accused of violating the rules of war and executed after the war. But does the deliberate bombing of residential areas somehow differ from the torpedoing of a passenger ship? In Nuremberg, during the show trial over fascism, the Americans and the British covered up the crimes of Stalin, who covered up their crimes in return – everyone violated the rules of war at some point. But Stalin was still not so blood-stained. The Katyn case, which the allies did not mention during the process, stands no comparison with the destruction of Dresden … 135 thousand civilians were killed for no reason, and nearly a million more were crippled and wounded. And the entire city was destroyed. The magic of perception of these events is that in the mind of a layman the dropping of a bomb is a far cry from the shot in the head. They say that a pilot cannot see where he is dropping a bomb, whom he is killing. He’s not a murderer. While the one who shoots people in the head is a real killer. According to this line of thought, the one who drops an atomic bomb on a city is not a murderer. Indeed, he does not see who will die there. Thus, the one who pours poison into a water supply system is not a murderer, as well as a terrorist who plants a bomb in the plane, and the one who blew up residential houses in Moscow. I think there is no difference between being shot in the head in Katyn and dropping bombs on residential areas of Dresden. What is essential is that it is a deliberate murder of innocent people. I believe that it was the very Nuremberg [apparently referring to the Nuremberg trial] which became the starting point for the US addiction to bombing of civilians from other countries. The indicted German officers attempted to drew judges’ attention to the fact that the United States had violated the rules of war. Manstein [Erich von Manstein, a German commander of the Wehrmacht] later repeatedly wrote about this in his memoirs. The Americans fought with civilians — children, women, old people, which is shameful for any military. But Nazi criminals had their mouth shut. The destruction of Dresden has remained unpunished. But there is a rule: if a criminal goes unpunished, he continues to commit his crimes. Already at the Potsdam Conference, the USA found that they could completely control the situation, that no-one would put any claims against them for the destruction of Dresden. Having been convinced of their impunity, the United States finally decided to destroy Hiroshima and Nagasaki. That is where their special craving for bombing other countries stems from. In fact, this is the same thing as terrorism, because it is not an open and fair fight between soldiers, but a cowardly murder on the sly. And, apparently, the United States intends to drop bombs on the population of unwanted countries in the future. This is what the space defence system is being built for: to throw bombs, but be safe from receiving bombs in return. This, however, is a dangerous policy. Times are changing, technology is changing too. And one day, maybe soon, some Arab terrorist millionaire will destroy New York. And this fire will be only an extension of the fire that destroyed Dresden.